Saraki: Can He Pull Another Big Surprise In PDP Tomorrow? In this report, Tope Fayehun x-rays the chances of the Senate President, Dr. Bukola Saraki, in the presidential primaries of the main opposition party in the country, the Peoples Democratic Party (PDP), as the party holds its national convention in Port Harcourt this Saturday. The presidential aspirants of the party who are upbeat about clinching the party’s ticket, would slug it out in an exercise that is poised to define how far the party would go in the forthcoming 2019 presidential election. The delegates, drawn from across the 36 states of the federation and the Federal Capital Territory (FCT), both elected and statutory, will determine the candidate of the party among the motley crowd of aspirants, who are seeking to be elected as the party’s candidate. Pundits observe that the forthcoming presidential election might be the most competitive since the return from military dictatorship to representative democracy in 1999, because of the ‘actors’ involved. LEADERSHIP learnt that attempts by some party leaders to pick a consensus candidate among the aspirants were unsuccessful. All the aspirants preferred to go into contest, believing they could secure victory in a credible exercise. None of the aspirants can be considered a political neophyte because most of them if not all are veterans, who had at one time or the other participated in politics or wielded political power. In fact, they possessed different intimidating profiles. Whatever happens, one person among the numerous aspirants must emerge victorious in the pursuit of the prestigious ticket, as whoever emerges the party’s candidate would eventually challenge President Muhammadu Buhari of the ruling All Progressives Congress (APC) in the February 2019 presidential poll. However, Saraki is the only one being seen, according to observers, to be taking the game a notch higher as he is neck-deep in talks with both the statutory and elected delegates that are expected to vote at the convention. Saraki, it was further gathered, had won the support of no less than nine out of the 14 governors on the party’s platform. He is one of the aspirants to watch, being the leader of Nigeria’s Senate, and third in the political hierarchy behind President Muhammadu Buhari and Vice President Yemi Osinbajo. Analysts observe that Saraki has long been seen as having his eyes on the top job and has been linked to a string of recent political manoeuvrings that appear to be aimed at weakening the structures of the ruling party. They are of the opinion that it is most likely he wins the PDP presidential ticket based on his political spread and influence both in North Central geo-political zone and other parts of the country. With the way politics is played in this clime, they are of the view that it will be too dismissive to say a two-time former governor of Kwara state and current Senate President is a political midget. Saraki, in his own right, is a force to reckon with politically and a reliable politicians among his equal across the country. As governor of Kwara State, his administration focused, among others, on power generation and electricity, primary health care, agriculture and farming, as well as massive infrastructure development. “With this, coupled with the desire of power-brokers in a political party to field a politician whose ears they have, regardless of his political clout, he might be the one to get the ticket of the party”, they noted. A flashback at how he got the position he currently occupies in the senate shows that he is really in the race. Even when he was in the APC, Saraki lobbied some of his colleagues in the APC and struck a deal with his colleagues in the PDP to emerge as Senate President. In what most APC leaders consider “an original sin,” part of Saraki’s deal with the PDP led to the emergence of Senator Ike Ekweremadu as the Deputy Senate President, the act that shows him as a smart politician. It would be recalled that on the day he became the Senate President, the Kwara born politician drove his car into the National Assembly complex parking lot and put off the engine. No one noticed him because he wasn’t supposed to be in there. But there he was, calculating, plotting and scheming. He was also there a little too early for anyone’s liking. It was gathered that when the senate doors were eventually flung open for the day’s business, Saraki jumped out of his car and hurtled in with one mission, to become the Senate President. However, as he was up in his game, some senators elected on the platform of the APC were putting finishing touches to their plot to install Yobe born Ahmed Lawan as Senate President a few kilometers away, with the backing of bigwigs in the party. 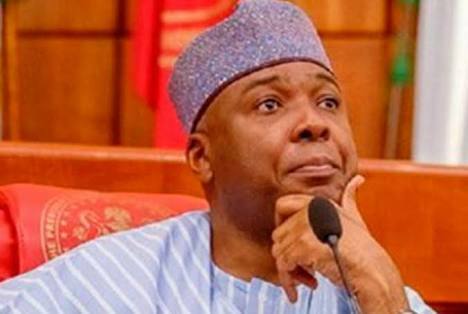 At the end of the day, Saraki, who had always maintained that leadership of the the senate should be elected and determined in the Senate chamber, became the Senate President with the backing of 41 PDP senators and and some APC senators who had broken ranks with their party’s National Working Committee (NWC). Meanwhile, the APC senators who had their party’s blessings to choose a senate president, were still locked in their plot when Saraki was announced president of the 8th senate. But, a good team player that he is, immediate after his emergence, he extended the olive branch to senators opposed to his emergence and the leadership of his then APC. That was how he incurred the wrath of his the then APC leadership and he was subsequently hounded by the nation’s anti-graft agencies and the nation’s Code of Conduct Bureau (CCB) for alleged false declaration of assets and money laundering. How he escaped all the traps was still a mystery because his name also popped up in the Panama Papers for alleged corruption and was linked to the Offa bank robbery of April which led to the deaths of over 30 persons. Currently, apart from seeking the presidential ticket of the PDP, Saraki re-enacted his 2015 stunt in July this year over a plot to impeach him as senate president because he dumped APC for PDP. Political watchers have come to see Saraki as man who is always on top of game. After the plot to get his back through the court over the asset declaration saga failed, the police later went after him for the Offa robbery incident. As the police surrounded his residence and convoy in the Lake Chad area of Maitama, Abuja, in the early hours of Tuesday, July 24, 2018, the senate president arrived the national assembly in a rickety cab; all in a bid to scupper his planned impeachment. In other words, he wasn’t even home when the police came knocking. He wasn’t a part of the convoy either. Minutes later, Saraki was reading out the names of 15 APC senators who were defecting to the PDP. While declaring his presidential ambition in August, Saraki itemized some of the reasons for his ambition, noting that Nigeria has no reason to be among the poor nations on earth, promising to turn the fortune of the country around for the better if given the opportunity to run the affairs of the nation from next year. The Senate President said the choice we face in the forthcoming election is either to keep things as they are, or make a radical departure from the old ways. To find a better way of doing things or keep repeating the mistakes of the past. To fix the problems or keep compounding them. He promised to see the youth play major roles at all levels, not only in government but also in the private sector and indeed in every area of Nigerian life. He stated that: “My Plan for Nigeria has inclusion in all aspects of the country’s affairs as a central pillar. Every citizen has the inalienable right to feel a sense of belonging, no matter their background or creed, or what part of the country they come from. No matter who you voted for or what your convictions are, government must work for you. “Your generation does not deserve to live in the poverty capital of the world. It is no longer an issue of how we got here, but how do we get out of this situation? I promise you that I will lead the fight and employ every God-given resource available to us in turning things around. “I am determined to grow Nigeria out of poverty. We will stimulate the growth of Small and Medium Enterprises (SMEs) as one of the ways of energising the economy and to create wealth for our people, especially the youth”. However, Saraki has been holding series of consultation and nocturnal meetings with who is who in PDP because he loves a good fight. He came face to face with his late dad, Olusola Saraki, politically and won. He’s sparred with members of his family politically and won. For Saraki, the end often justifies the means. With the game plan already on ground come tomorrow, analysts raised a germane question that with all the attributes that Saraki possess, can he again pull any surprises in the convention? Time will provide the answer.